"Ballast Island" was created when sailing ships dumped their ballast of boulders and other materials at the City of Seattle's waterfront before taking on cargoes of lumber, grains, or other goods destined for San Francisco and other ports. Duwamish families and other Native Americans came by canoe to the Seattle waterfront. Some were seasonal visitors, seeking work. Native Americans harvested and sold shellfish, and sold woven baskets and carvings, catering to the Whites'* (maybe another way to say this?) demand for souvenirs. Some were traveling to harvest the hopfields upriver. For some Duwamish, Ballast Island became a year-round residence by 1885. The Duwamish had been forced from their Longhouses in the new city of Seattle and other parts of their homeland. The United States Army and other Whites* burned the Longhouses to prevent the Duwamish from returning to their traditional homeland. Many Duwamish people did not want to relocate to live with traditional enemies at reservations built far from their ancestral villages and burial grounds. For several years, they were allowed to live on the bleak parcel of land, devoid of fresh water and other vital resources. 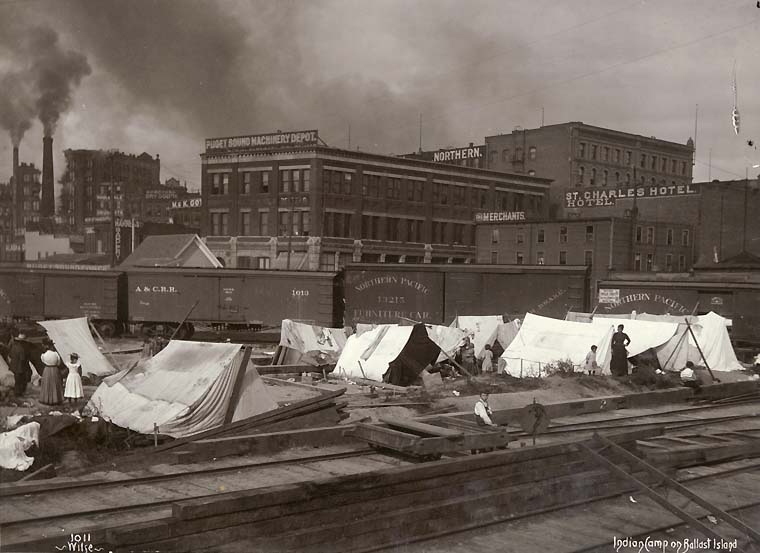 Over time, the Duwamish adopted the use of canvas tents to replace their traditional cattail mat shelters. In time, even Ballast Island became too valuable to the settlers and the Duwamish were exiled once again. By 1917, at the beginning of World War One, Native Americans living on Ballast Island was a distant memory.